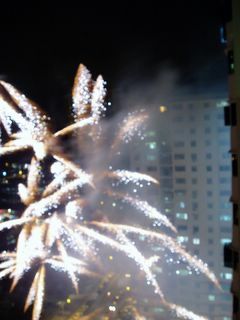 Yep - Chinese New Year - yep, the fireworks were as close as they look. What a blessing I have to have Michelle! She came down to visit from a meeting she was having in Thailand and we did our best to "paint the town (island) red!" We, of course, visited my friends at Starbucks :), went horseback riding on the beach, ate sizzlin chicken (I hear the ooo's and aaaa's of the people who know what that is), went up Penang Hill on an incline railroad to see a beautiful sunset, visited a huge temple - the Goddess of Mercy, shoe shopping at a 6 story mall, Dance Dance Revolution (oh yeah!! ), over to a friend's house for some great food, and had a great Valentine's Day dinner!! 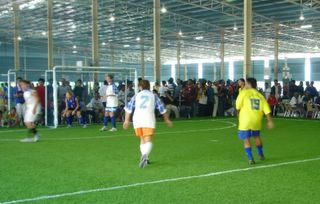 Check out the pictures!! All that in just 2 days!! 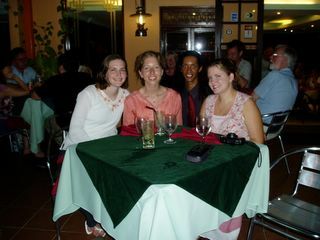 Valentine's day dinner with Michelle, Julia, and Jeremy - thank you for everything Jeremy! 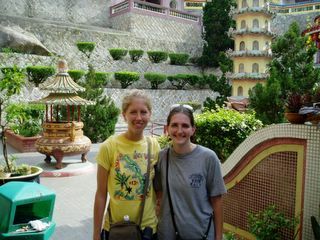 Us at the Goddess of Mercy temple. 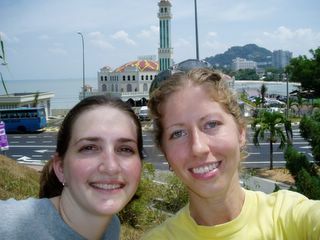 Michelle and I in front of the brand new mosque built over the water here. 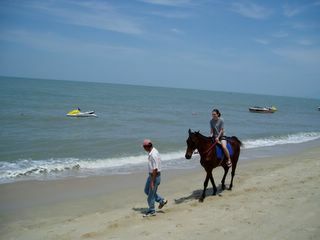 Michelle riding "Easy Mover" an ex-racehorse, on the beach! Well right now everyone is celebrating Chinese New Year! It has really been fun to see all the fireworks and the dragon dances (sorry, I'm working on getting pictures). But, if you are the type that loud noises make you jump, here is not the place for you. Chinese New Year has been going on since Tuesday (Feb. 8), the eve of the New Year. The celebrations can last for two weeks easily. I have yet to lose my hearing, but there have been some pretty close calls. I do love fireworks, for those who grew with me, you know we had too much fun with them. However, my parents were always making sure that us kids weren't completely endangering our lives. I have never been so close to large scale fireworks, but the zeal of my Chinese neighbors has truly given me a jump here and there. 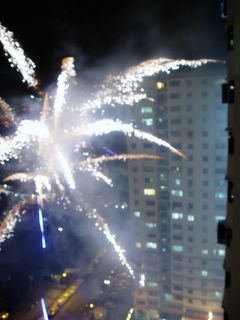 I must say it is really neat to sit in your living room, and have fireworks go off right outside the window - literally. They may as well have landed inside my apartment. It is crazy, but fun - and freeing to be away from the safety-hazard conscious USA sometimes - though it is a little disturbing to see a 5 or 6 year old lighting fireworks in his hand! Gong Si Fa Cai!! Chiropractors...hmmm. Are they worth it? :) So, I haven't had a proper back adjustment for a really long time now. The aches, knots, and pain were finally getting to me. Since this country has medical discipline similar to the States, I really never had a concern, well, that is until the lack of communication in another country comes into play. Simple visit to the doctor? Never - nothing is just as simple as that - not even going to Tesco (the Walmart here - a real life-saver). So, I finally find the place I'm looking for and actually get into a spot that is the proper size for my car (which is unusual). A good beginning... I go into the hospital where the doctor is (here I was told that the doctor who is in charge of physiotherapy can give adjustments). Things are fine, until I ask the information desk where Dr. Loh's office is. "Just use the elevator right here," the lady says to me. Ok, hmmm, which floor - oh, in the back of my mind I do remember that the lady who set up the appointment for me said the 4th floor. Well, as I walk down the hospital room lined hallway, I decide that there is something terribly wrong. This doesn't look like it has anything to do with physiotherapy, or Dr. Loh. Luckily, I find a nurses station, and attempt to ask for help and assistance in finding Dr. Loh. After much laughing and blank "and-I'm-supposed-to-help-you?" stares, one nurse kindly escorts me to the physiotherapy place - back down the elevator to another part of the hospital. Physiotherapy...hmmm...no one is there and the lights are dark. Finally someone comes in and questions me as to why I'm there. I tell them "I have an appointment with Dr. Loh." "Dr. Loh?" they say. "It's 'Dr. Loh,' not 'Dr. Loh.'" Ok, it all sounds the same to me, but I'll try to change something about how I'm saying it. Thirty minutes later in the middle of someone telling me how bad my posture is and different excersizes to correct back problems I ask again - "where is Dr. Loh? I have an appointment with Dr. Loh." After a puzzled look from that person, they send me down to yet another part of the hospital and tell me to check in at the registration area - but not until they give me a pricey bill for physio. Apparently, I hadn't found Dr. Loh, but I did get physio that I didn't need - and I had to pay for it. The lady at the registration area asked me who I was going to see and after being corrected in my pronunciation of Dr. Loh about 5 or 6 more times (and wanting to scream my head off at the whole situation) she checked me in, about 1 hour after the proper check-in time for the appointment. Finally, Dr. Loh's office - could it really be? I had come so far, most of the day gone from the confusion in the hospital. Wow, I even made it to where I was actually sitting in front of Dr. Loh. Then he told me - "I don't give back adjustments, you'll have to go to a chiropractor." Oh, but I did have to pay for that appointment too? Ahh, yes I did. A whole day gone, but what did I get? A headache, a desire for the United States, a pricy bill, stress, and.... really good appointment with a chiropractor. Moral of the story? If it's a chiropractor you want, don't ever, EVER, try going somewhere else. Oh, and, patience, patience, patience! On Tuesday I was able to take a "business" tour around the country - not the whole country, mind you, but it was a long day. 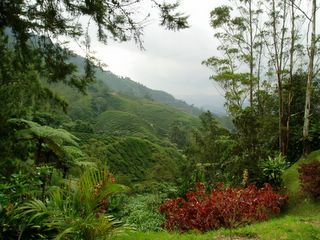 One of the great highlights was going to the Cameron Highlands. 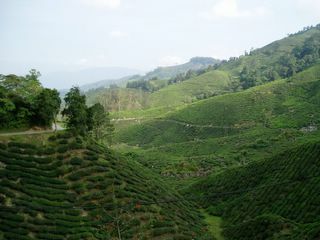 This area, which reminds me of the Smokies, is devoted to fresh produce and known for its tea plantations - boy were they amazing! It is also much cooler here than other areas in the country. I actually had goosebumps for most of the time we were there. We even turned the air conditioner off in the car! I think that my brother would truly enjoy this place (seeming as South Georgia summers are not his forte)! On the way up a curvey road to the Higlands, one can stop at one of many waterfalls for a cooling toe dip! A beautiful view of the tea plantations - this particular plantation belongs to BOH tea, the most popular tea producer here. Another view of the plantation. In the foreground, one can see a variety of red poinsettas. On the tea plantations, these poinsettas are used to mark the fields, though in this picture they are just for landscaping. 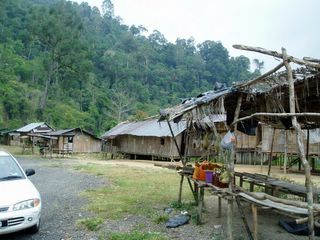 This village was right on the side of the road. It was amazing to me to see what pavement could take us to. 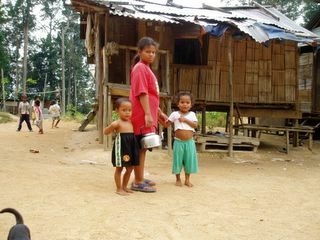 A group of Orang Asli children in front of their wooden stilted homes. 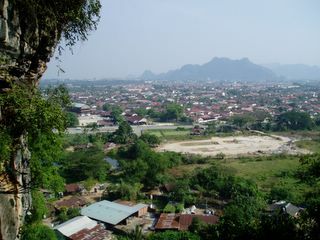 The homes are raised off the ground to protect from cobras in the night. A view from inside the temple cave after I had explored through the dark a little bit! 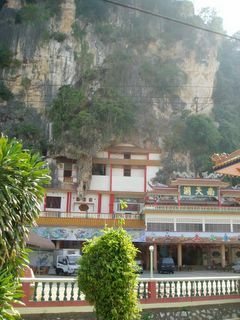 Also on the trip, we visited a Buddhist temple set among caves in the side of a mountain. It was very interesting to see the inside of this temple cave. Soccer goalie or volleyball player? 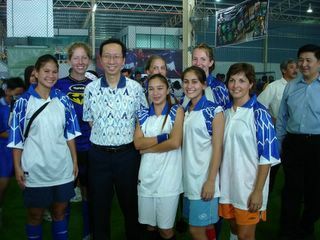 Proof that I actually played goalie! This is for you, Michelle!